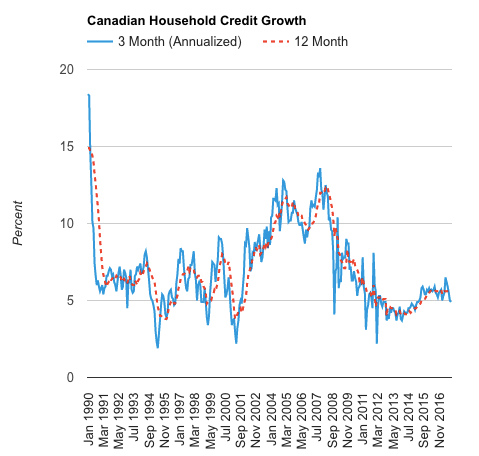 Despite Canadian households hitting a record level of debt to income at 171% in the third quarter of 2017, it appears the rate of household credit growth may actually be slowing. 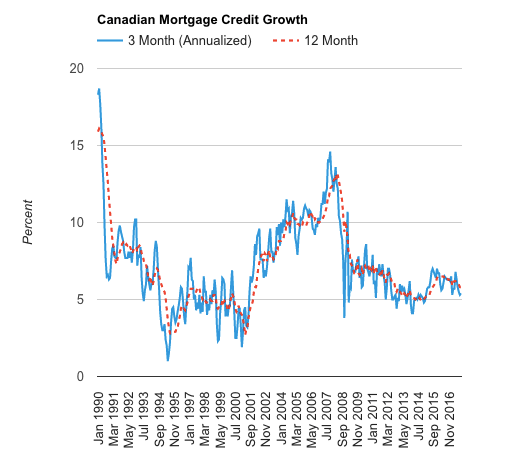 Recent insights from Better Dwelling and the Bank of Canada suggest credit in the household sector has been decelerating in recent months. The annualized 3 month trend of household credit growth dropped to to 4.9% in October, a 5.76% decline compared to the same month last year. This is significantly below the 12 month trend, which currently reads 5.5%. So yes household credit is still growing but at a slower pace. Mortgage credit growth also appears to be slowing. The three month annualized trend printed 5.4% in October, a 14.28% decline compared to the growth we saw last year. It was also a decline compared to the 12 month trend, which is 5.6%. Real estate prices are closely correlated to mortgage credit growth. As credit is readily available and borrowers have an appetite to borrow, house prices will rise. It works the same in reverse. If prices begin to fall and or lending policies tighten (think stress test) it can lead to mortgage credit slowing which, if it continues, can be a drag on home prices. 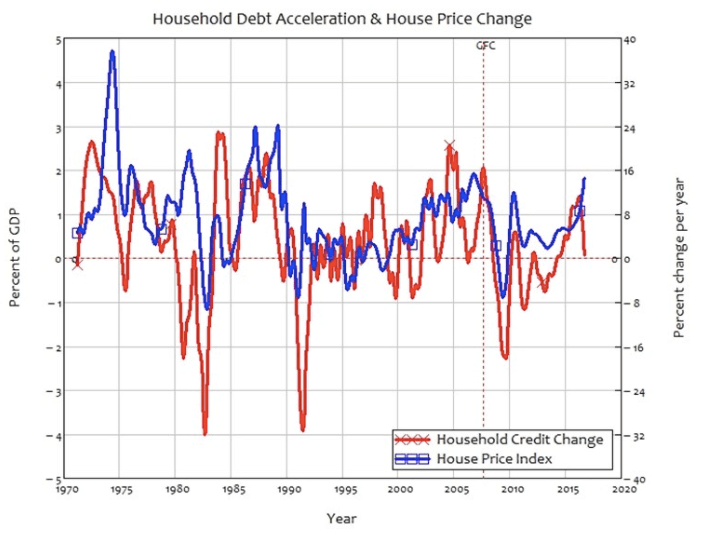 Professor Steve Keen highlights the relationship of household/mortgage debt acceleration as a percentage of GDP and the rise in home prices. This will be the trend to watch in 2018, particularly with a new mortgage stress test beginning in January. Ben Rabidoux of Northcove Advisors, an astute analysts of Canadian credit trends is also noticing the slowdown. He talked about it in detail in a recent podcast with personal finance commentator Preet Banerjee. The story of Canadian credit growth and overall indebtedness has the world on watch and will continue to be a must follow macro trend.